When thinking of what to worry about in their house, many people overlook protecting against pests—termites, in particular. A termite infestation can cause thousands of dollars worth of damage, so it is best to take preventative measures before that can happen! There are a few ways in which you can prevent termites from getting into your home sooner, rather than later. The first, and possibly most important, way to prevent termites from infesting your home is getting your home regularly inspected for termite damage, preferably once a year. These regular inspections by trained professionals can save your home from termite infestations by stopping the termite before they can make their way further into your home. This early detection can be vital in preventing other termites from coming into your home. The next way to prevent termites from getting into your home is sealing off access for the termites. Termites can get into your home in several different ways, so you want to be sure that all easily sealed entrances are closed off. This includes sealing off any cracks or holes that might be in the foundation of your house, and looking for any other access points that the termites might use. Lastly, make your home less attractive to termites. You can do in a couple of different ways. First, eliminate excess moisture. Fix any water leaks in your home. Termites need water, so an easy water source will make them more likely to come to your home, so also remove any pooled water around your house. Additionally, remove brush or other vegetation from around your home, which can create areas of moisture, also attracting the termites. In addition to eliminating water, store building materials and firewood away from the house. Wood is termites’ primary food source, so having wood close to your house will make your house much more appealing to the termites. By taking these small steps, you can prevent thousands of dollars in damage that can result from a termite infestation. Do you have a termite problem? Is there a termite infestation in your home? Do you suspect you might have termites? 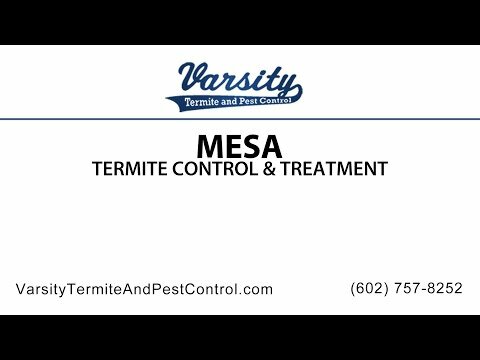 Varsity Termite and Pest Control is here to help you! With out experienced termite exterminators in Mesa, they will do a termite inspection and make sure your home is termite free the correct way. Contact Varsity Termite and Pest Control today if you have any questions or concerns regarding your home with termites, our professional team will be sure to help you to the best ability they can and ensure you get all the answers and information you need. Our other services include pest control and scorpion control. So what are you waiting for? Contact us today or visit our website for more ways to prevent termites and information.